The extra-solar planet ("exoplanet") known as WASP-12b is perhaps the strangest world found yet. While known for almost a decade, astronomers recently observed it during an eclipse, allowing them to measure its reflectivity (or albedo) for the first time. What they saw: Surprisingly, WASP-12b has only half the albedo of the Moon, and about 1/6th that of the Earth, meaning it reflects very little light. 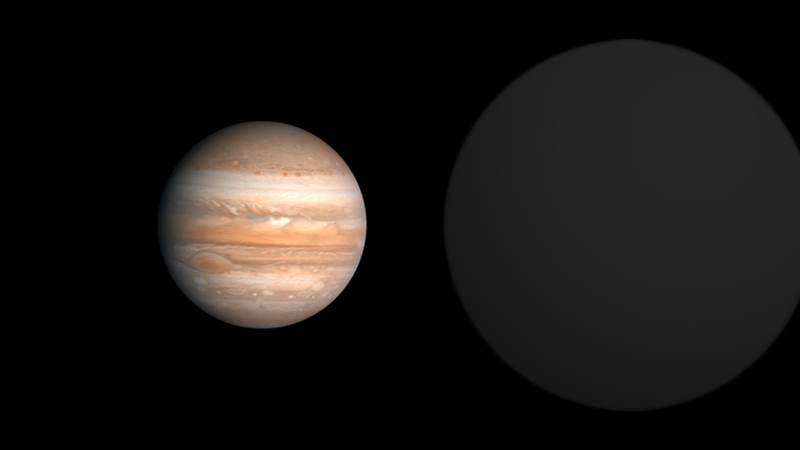 It doesn't end there — the exoplanet is twice as large as Jupiter and orbits 16 times closer than Mercury does around the sun.This proximity heats WASP-12b to almost 5,000 degrees Fahrenheit, meaning that despite its blackness it glows deep red like a massive gaseous charcoal briquette. The bottom line: The variety of worlds we're finding in the galaxy far surpasses even the wildest sci-fi stories, and is providing insight into the range of physics and chemistry in the universe.